The Ultimate Fighting Championship is set to have one of, if not the, most successful nights in the organization’s history thanks, in part, to a long-awaited fight and an unlikely (and rather outspoken) Irishman the UFC says will be a bigger star than boxing legend Floyd Mayweather. 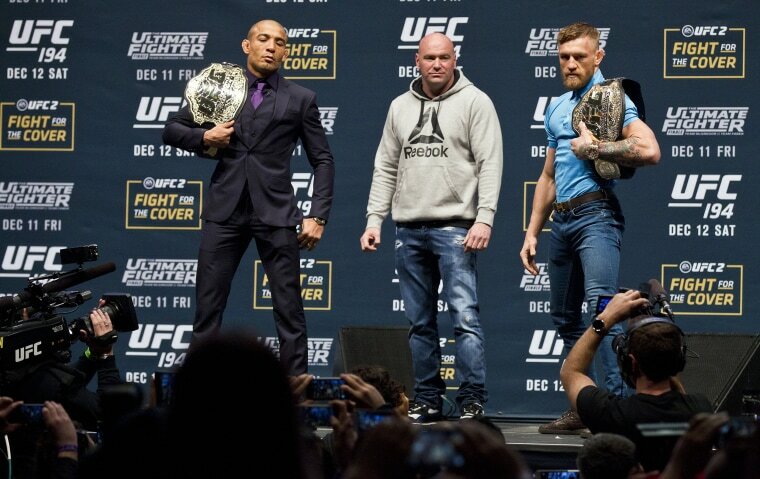 UFC 194, scheduled for Saturday, is the final UFC pay-per-view event of 2015. The long-awaited match-up between reigning UFC featherweight champion José Aldo and fighting Irishman Conor McGregor is not only expected to settle the score. It’s also expected to bring in record revenue for the UFC — another big indicator of the brand’s continued progress in the world of sports. The world’s largest mixed martial arts promoter has embarked on one of the most ambitious endeavors in its history: three fight cards in three days, 30 fights in total, all culminating in UFC 194, the main event headlined by Aldo and McGregor, which is expected to set a new UFC record with live gate sales of nearly $10 million at the MGM Grand Garden Arena in Las Vegas. The bout marks one of the most anticipated clashes in the sport’s history and will determine the undisputed featherweight champion. Originally slated for July, Aldo pulled out with an injured rib less than two weeks before the fight. In his stead, Aldo’s previous top rival, Chad Mendes, stepped in on short notice to tangle with McGregor for a newly minted interim title. It was McGregor’s stiffest challenge and most fiercely contested bout to date in the UFC. It was also one of its most lucrative with gate sales setting a US record at $7.1 million. The worldwide record is $12.1 million set when George St. Pierre beat Jake Shields in Toronto — a fight that was watched live by more than 55,000 fans at the Rogers Centre. By comparison, the MGM Grand Garden Arena’s capacity is a more modest 16,800. Aldo (26-1) who has been the UFC’s World Featherweight Champion since winning what was then the WEC belt in November 2009, is a soft-spoken Brazilian — the strong silent type. McGregor, by contrast, is anything but. The Interim Featherweight Champion rarely holds his tongue. But when the two of them face-off it promises to be one of the most-watched bouts in UFC history and both McGregor and the UFC have an enormous amount riding on it. There are set to be more than 16,000 fans in the stands and an estimated 1-2 million more at home who paid $49.99 a pop to watch on TV. This event alone stands to make the MMA promoter some much-needed millions. Oddsmakers, who tend to put more stock in dollars than hype, have set McGregor as the favorite. UFC 193 featuring Ronda Rousey vs. Holly Holm drew a UFC record crowd of 56,214 in Melbourne, Australia, but the gate was $6.8 million U.S. dollars. There will be barely more than a quarter of that number of people in attendance Saturday at the MGM Grand. The bout is also set to top the year's best pay-per-view figures with McGregor's knockout win over Mendes (825,000 PPV buys) and Rousey's defeat by Holly Holm last month (1.1 million PPV buys) leading the way. A spokesperson for the UFC said the event is likely to be one of the biggest of 2015 and the last 5 years. One of those talents is the Irishman — a crude, lewd, trash-talking tyrant. And whether you love him or consider him loud and obnoxious, there’s no denying Conor McGregor has become one of the UFC’s hottest commodities, bringing in millions every time he steps in the octagon. Dublin-born McGregor, who went from being a plumbing apprentice who once had his Opel Astra repo-ed to a world-renowned mixed martial arts fighter in the span of just two years, has rocketed to stardom. Known to his fans as “The Notorious,” McGregor is notoriously outspoken, his bravado often eliciting a visceral reaction from his opponents. Since swooping into the UFC in 2013, McGregor has become a lightning rod for controversy — telling reporters recently he will soon ink the first-ever $100 million UFC contract. Investing in big stars like McGregor has paid off big-time for the UFC. White and his business partners, Frank and Lorenzo Fertitta, bought the UFC back in 2001 for $2 million. Last year, White said the company was worth $3.5 billion. As a private organization, the UFC does not discuss financials. But 2014 was lackluster at best with PPV numbers in a steady decline. 2015 has been another story entirely. Unlike the NFL, NBA and MLB who disclose top player salaries, UFC fighter salaries are kept under lock and key. It is rumored that they don’t begin to approach mainstream sports money, but information is scarce. For example, the fighter making the most money right now may, in fact, be a woman. Ronda Rousey is the self-proclaimed highest-paid fighter in the UFC. Like other top fighters, Rousey gets an undisclosed percentage of the revenue earned from PPV sales. More people watched Rousey vs. Correia than McGregor vs. Mendes earlier this year. Forbes Magazine estimated that between fights and endorsements, Rousey made an estimated $6.5 million from June 2014 to June 2015 alone. Rousey insists that despite her lucrative earnings, she provides value for the money she earns. McGregor argues the same. Personality clearly plays a big role in UFC fighters’ popularity and the trash-talking is just a part of the game. It’s what keeps fans tuning in to see McGregor time and again. Chael Sonnen, a former UFC Middleweight fighter and now MMA analyst for ESPN, says all eyes are on McGregor. While McGregor was a much more relaxed and toned-down version of his usual self Wednesday at a UFC press conference, he still had plenty to say.